It is the hallmark of every cinematic auteur that no one else can harness the power of film to tell stories quite the way they do. Love him or hate him, this has always been true of Brooklyn’s finest iconoclast American writer and director, Spike Lee. Since his debut feature She’s Gotta Have It released in 1986, no one has chewed up, used and renewed cinema quite like Spike. It could be argued that no one dares, for the subject matter of his films is nearly always taboo, but the manner in which Lee tackles difficult questions is nearly always in equal parts brave, bold and entertaining. Those who have seen Do The Right Thing, Jungle Fever, Crooklyn, Clockers and the grossly misunderstood and underrated satire Bamboozled, will be used to finding Lee harnessing the disarming power of humour to bring a wider audience to films that are just as concerned with challenging and educating as they are with entertaining. Even so, BlacKkKlansman stands apart. On the surface, a high-concept crime drama, Spike Lee’s deft direction elevates the film to something truly special by effectively framing the drama within overlooked cultural history. I left the theatre wondering what other filmmaker working today could start a film with civil war scenes taken from Gone with the Wind and end with newsreel footage from last year’s neo-Nazi march in Charlottesville, while touching upon hard truths about slavery and the representation of race on film, and still make it a funny, thought-provoking and entertaining adventure. I’d argue, none. Spike Lee is not afraid of grey areas, and arguably the psychological strength of his insights into human nature lies in his refusal to lean on cliché when it comes to his characters. This does not mean that he does not paint with a broad brush. He does. In this film alone, he takes on many of America’s most treasured myths and institutions as only he can, but despite the scale of his cinematic visions and desire to represent a fight against the powers that be, it is wisdom with which he explores the consequences of ill-conceived decisions, the heartfelt moments and subtle humanity that blow you away. When Trump was elected, I sat with an American friend in London and searching for something positive to say, I suggested that maybe, just maybe we might see the best of America in response to Trump’s warped vision of the world. 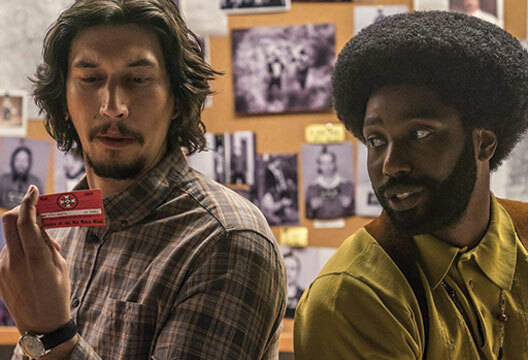 BlacKkKlansman, for my money, is the finest artistic response we’ve had yet from a visionary auteur who is sliding smoothly toward becoming one of the greatest American filmmakers of all time, and arguably the one that matters most.